The focus in PE at the end of last school year was on My Plate.A great visual of a dinner plate with color-coded sections to help students understand what a healthy and balanced meal looks like. 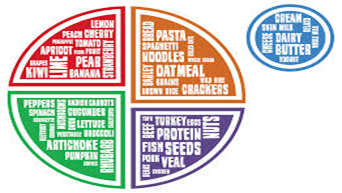 Ask your student(s) to tell you what food groups are represented on his or her plate at meal time and see if, as a family, you are eating a healthy and balanced diet! Intermediate students are also learning how much to eat from each food group each day. Our school nurse, Sarah Lewis, visited students in grades K -2nd grade during their PE time to discuss the importance of handwashing to reduce the spread of germs. Through the use of “Glo Germs” which are simulated germs that glow under an ultra violet light, we were able to see how quickly germs moved from surface to surface as “infected” hands touched other hands and items like markers and walls. Hands should be washed with soap for at least 15 seconds. A good way to help your student with this concept is to have him or her sing their ABCs through once or a short song like Happy Birthday or Twinkle Twinkle Little Star through twice before rinsing. Please review good hand washing practices with your student(s) and remind them to always wash hands before eating. Did you know the thumbs are nails are the most commonly forgotten parts when washing hands?